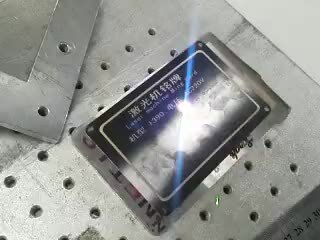 In the industry field, fiber laser marking machine are widely used in integrated circuit chips, computer accessories, industrial bearings, watches, electronic and communications products, aerospace components, various automotive parts, home appliances, hardware tools, molds, wire and cable, food Labels for graphics and text in many fields such as packaging, jewelry, tobacco, and military, as well as mass production line operation. 1. Alumina is cracked to be black color. There is MOPA technology fiber laser marking machine with adjustable pulse width. 2 Mark color on metal. User has to adjust and try some parameters according to the material. It can get can variety of colors on the stainless steel. 4. On-line fly marking work. It means that the fiber laser marking machine is combined with the assembly line to mark when feeding. This will greatly improve our work efficiency. 5, Portable fiber laser marking machine. It is small and no occupy the place which can meet the basic marking requirement. In material field, the fiber laser marking machine is used for rigid, brittle, dark material and most of the metal materials, as well as certain non-metallic materials such as plastics, fiber laser marking machines can mark. Marking effect is based on actual results. Of course, the price of the two machines is also different . Thus, the end user should choose the suitable one according to their own production requirements and cost control.